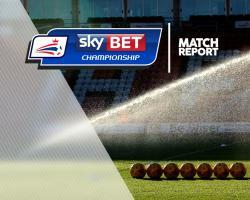 Reading secured their sixth win in seven Sky Bet Championship matches by overcoming fellow play-off hopefuls Sheffield Wednesday 2-1. A poor game came to life in the second half when Dutch winger Roy Beerens struck twice in 19 minutes for the home team. Wednesday had been the better side until then, with Lucas Joao wasting their best chance, but their defence fell apart to allow Beerens to capitalise and, although substitute Steven Fletcher nodded home a consolation in stoppage time, the visitors could not find an equaliser. Both sides were missing key players at Madejski Stadium due to suspension. Reading were without midfielder Danny Williams, who was sent off in the previous 5-0 defeat at Fulham. The Owls had to do without striker Fernando Forestieri, who was dismissed in last weekend's 2-1 victory over Preston. Wednesday were looking for a third straight league victory, and made an encouraging start, with Barry Bannan proving dangerous as he cut inside from the left flank. However, it was Reading who created the first chance, when Liam Moore nodded over from a Garath McCleary corner. The visitors responded positively, with Kieran Lee's shot deflecting over and Bannan driving narrowly wide. Atdhe Nuhiu also tried his luck from distance, only to fire off target, before Ross Wallace drew a fine save from home goalkeeper Ali Al Habsi from a well-struck 20-yard effort. Reading kept possession well but did little with it and Wednesday were rarely troubled at the back in a drab first half. Wednesday still looked the most likely to break the deadlock and Wallace again tried to beat Al Habsi from outside the area but his attempt lacked direction. Reading threatened only occasionally, with Paul McShane heading wide at the far post from a McCleary free-kick. The second half swiftly followed a similar pattern, with Reading building patiently yet ineffectively and Wednesday looking to attack on the break. Bannan wasted a free-kick from a promising position 25 yards out, shooting over the bar, and Joao should have done better when racing clear of the home defence. But, having appeared to wrong-foot Al Habsi, he then inexplicably dragged his attempt wide of the post. It was to prove costly as Reading went ahead in the 57th minute. His left-footed shot might not have troubled Wednesday goalkeeper Keiren Westwood but it took a wicked deflection off Glenn Loovens before nestling in the net. Rejuvenated Reading stretched their lead in the 76th minute when Yann Kermorgant flicked on an Al Habsi clearance and Beerens beat Westwood with a cleverly angled drive. Fletcher headed home via a post near the end but it was too little, too late for Wednesday.